Drinking cherry concentrate can lower systolic blood pressure for up to three hours, our latest study found. If tart Montmorency cherry concentrate was a drug, it would probably get FDA approval. Tart Montmorency cherries are rich in a number of plant compounds that have anti-inflammatory and antioxidant properties. In cell and animal models, cherry extracts have been shown to have a range of cardiovascular health effects. Cardiovascular disease (CVD) is the biggest killer, globally. In Europe, CVD is the leading cause of death in adults and is responsible for nearly half (48%) of all deaths. And in the US, 25% of deaths are attributed to CVD – that’s about 610,000 premature deaths each year. Raised blood pressure is the greatest risk factor for cardiovascular disease and even small reductions in blood pressure can have a big impact on mortality rates. Blood pressure is recorded as two numbers. Systolic blood pressure (the top number) measures the pressure in the arteries when the heart contracts, and diastolic blood pressure (the bottom number) measures the pressure in the arteries between heartbeats (when the heart muscle is resting between beats and refilling with blood). Normal blood pressure is considered 120/80mmHg or below. Anything between 120-140 (systolic) and 80-90mmHg (diastolic) is known as pre-hypertensive and anything higher than these values is classified as hypertension. The further along this chain you are, the more likely you are to experience heart disease. Hypertension usually clusters with other cardiovascular risk factors such as ageing, being overweight, insulin resistance, diabetes, and hyperlipidaemia (high levels of cholesterol and triglycerides in the blood). In recent years Northumbria University has undertaken a number of studies into the health benefits of tart Montmorency cherry concentrate. We have have found that drinking the concentrate improves the quality and quantity of sleep. It also reduces gout symptoms. In this study, we examined the acute effects of the consumption of Montmorency tart cherries on arterial stiffness, blood pressure and dilation of small blood vessels in men with early hypertension. Sixteen non-smoking men with early hypertension (with systolic blood pressure of 130mmHg or above, and diastolic blood pressure of 80mmHg or above – or both) took part in the study. At the start of the study, the participants provided a blood sample and we assessed their general cardiovascular health. Each participant then received either Montmorency tart cherry concentrate, diluted with water, or a placebo (fruit cordial). We took blood samples and assessed cardiovascular function one, two, three, five and eight hours after they drank the juice. Blood pressure was taken hourly. No food or drink was provided during the study period except for mineral water. Each person returned to the lab at least two weeks after the first visit to repeat the test with the other intervention drink. As far as we know, this is the first study to show that systolic blood pressure can be lowered by drinking cherry juice. Previous studies have demonstrated that foods such as cocoa, beetroot and grape extract can have a positive effect on blood pressure. Our study is particularly noteworthy because data from observational studies have shown that lowering average (mean) systolic blood pressure by 5-6mmHg over a five-year period is associated with a 38% reduced risk of stroke and a 23% reduced risk of coronary heart disease. Compared with the placebo, we found that cherry juice concentrate reduced peak blood pressure by 7mmHG. The blood pressure lowering effects of cherry juice are comparable to those achieved by some antihypertensive drugs – such as beta blockers and diuretics – in people with mild hypertension. Our findings suggest that Montmorency cherries could be used alongside standard treatment to manage hypertension. We found that the greatest improvements in systolic blood pressure occurred in people who had the highest blood concentrations of some of the phenolic compounds found in Montmorency cherries. Although long ignored, phenolic compounds – which are found in many plants – are now attracting widespread attention. Unlike the “traditional” nutrients, they don’t seem to be essential for short-term well-being – but there is increasing evidence that long-term intakes may reduce the incidence of some cancers and many chronic diseases, including CVD. 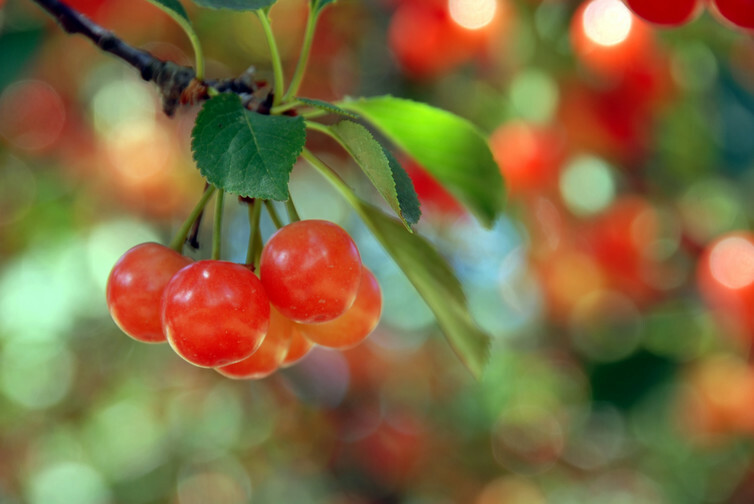 We attribute much of the previously established health benefits of Montmorency cherry juice to these plant compounds.